Well, let me share something with you. I “thought” I wanted to paint glass bottles.. I started and realized I was way out of my league. What a mess! Such an advance painting project for an essentially a beginner. Although I painted regularly years ago and did ok. 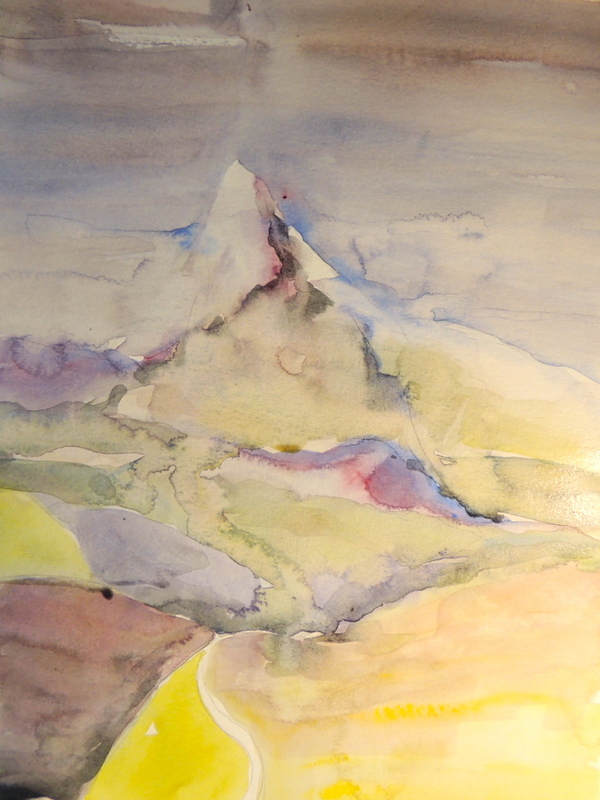 It is very much apparent to me I need to get my watercolor knowledge back. 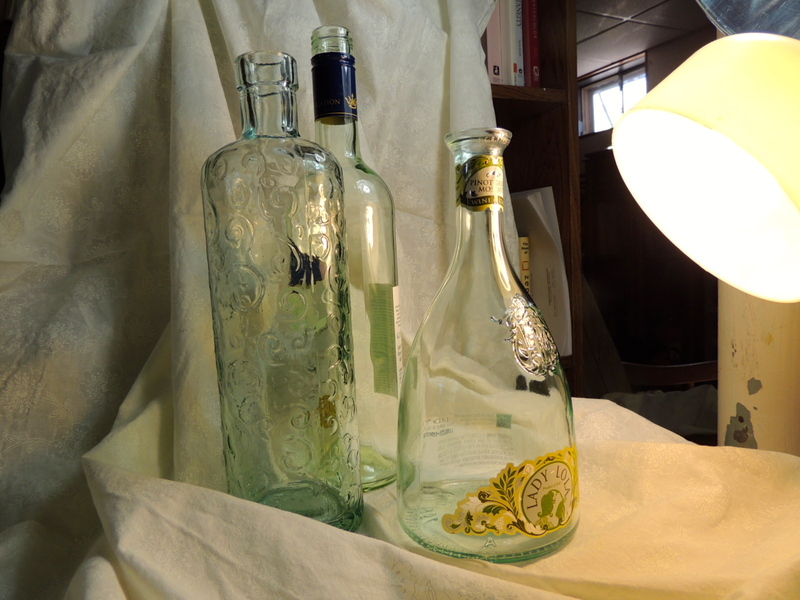 So I carefully put away my glass bottles… and pulled out my painting palette to experiment . I’m keeping it to just 6 colors at the moment. I also pulled out one of my favorite books by Jeanne Dobie “MAKING COLOR SING”. Today just sharing my “experimentation” with my 6 colors… She has a chapter describing luminous grays. By mixing your one of your primary colors with their compliment you can create these most gorgeous grays. This is just experimenting, and as I look at this loose painting it probably could use more detail.. 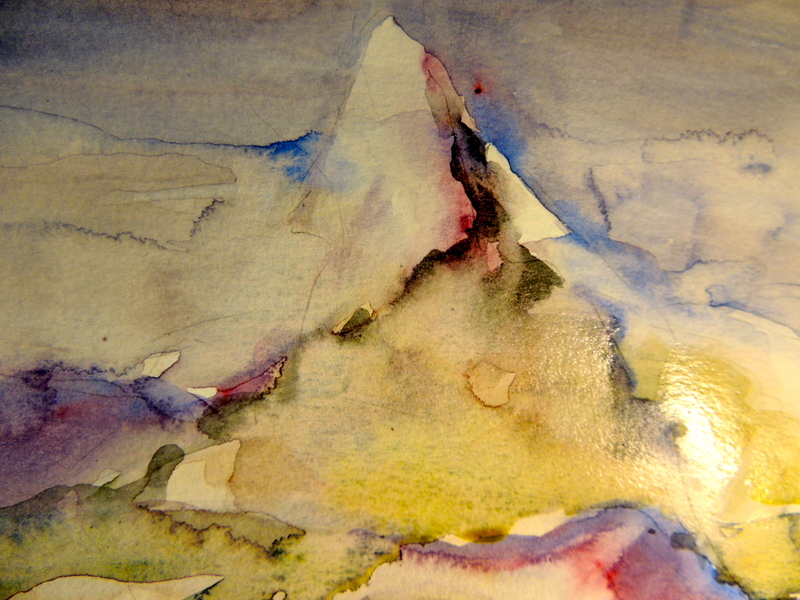 It is suppose to be a mountain scene, ( I’ve included a close up view of the top of this painting) I followed her example to work on my mixtures. It is a beginning.. trying to get what is in my head down on paper. I figure every time I paint it will help, and I will learn. Watercolors can easily turn to muddy colors so easily So I’m in great need to figure out how NOT to do that! .. I want beautiful colors.. This picture just shares the mixtures done today along with my mixtures of mouse colors. These grays are not neutral by any means, they actually have colors to them, they can be cool , warm, greenish, reddish,blueish, at any intensity needed.. This is what has pulled me to watercolor is the gorgeous luminosity, I don’t want to simply copy a scene I want to create a scene from reality. Make it artistic if this makes any sense. Let me show you the picture of what I wanted to attempt… took lots of great pictures to do later!! What was I thinking??? lol Someday I’ll go back to it.